Praised for its appealing writing style and clear pedagogy, Lowe's Quantum Chemistry is now available in its Second Edition as a text for senior undergraduate- and graduate-level chemistry students. 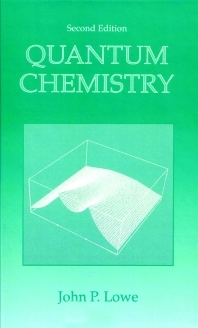 The book assumes little mathematical or physical sophistication and emphasizes an understanding of the techniques and results of quantum chemistry, thus enabling students to comprehend much of the current chemical literature in which quantum chemical methods or concepts are used as tools. The book begins with a six-chapter introduction of standard one-dimensional systems, the hydrogen atom, many-electron atoms, and principles of quantum mechanics. It then provides thorough treatments of variation and perturbation methods, group theory, ab initio theory, Huckel and extended Huckel methods, qualitative MO theory, and MO theory of periodic systems. Chapters are completed with exercises to facilitate self-study. Solutions to selected exercises are included. Classical Waves and the Time-Independent Schridinger Wave Equation. Quantum Mechanics of Some Simple Systems. The Hydrogenlike Ion, Angular Momentum, and the Rigid Rotor. Postulates and Theorems of Quantum Mechanics. The Simple Huckel Method and Applications. 9. Matrix Formulation of the Linear Variation Method. The SCF-LCAO-MO Method and Extensions. Molecular Orbital Theory of Periodic Systems. Evaluation of the Coulomb Repulsion Integral over 1s AOs. Angular Momentum Rules from Operator Algebra. 5. The Pairing Theorem. Huckel Molecular Orbital Energies, Coefficients, Electron Densities, and Bond Orders for Some Simple Molecules. Derivation of the Hartree-Fock Equation. The Virial Theorem for Atoms and Diatomic Molecules. Values of Some Useful Constants and Conversion Factors. Group Theoretical Charts and Tables. Hints for Solving Selected Problems.